Why Are Pioneering Female Composers So Neglected? May first and May eighth, starting at 6:45pm, I’m giving a pre-concert talk at the James J. Hill House in St. Paul for the Hill House Chamber Players (most of whom are current or former Minnesota Orchestra players). All the details, including ticket information, are here. You can like their Facebook page, and read up on the women featured, here. The program includes music by Lili Boulanger, Fanny Mendelssohn Hensel, and Gabriel Fauré. Fauré and Bach are my two favorite composers, so it’s a deeply meaningful program to me, and I hope to you, too. It certainly is a beautiful one. Hill House Chamber Players Concert! Hey, guys! Anything new since my last entry in…November? Good. I’m glad everything has been so serene and uneventful. Sorry about the break. I swear it has been unintentional. I’ve just been swamped by stuff in my personal life, the details of which I will not bore you with, and suddenly it’s March and we’re a few weeks away from planting our potted pansies. I’m alive, I’m well, and I’ll probably resurface in the blogosphere soon. But I’m not writing about my not writing. I’m writing to remind you of the Hill House Chamber Players, a group I was honored to be asked to give pre-concert talks for during the 17/18 concert season. The Players consist of star Twin Cities musicians (including a few Minnesota Orchestra members) performing at the James J. Hill House on Summit Avenue in St. Paul. Their next concerts are being held Monday March 6 and Monday March 13th. Both nights feature the same marvelous programming: works by Mozart, Clara Schumann, and Rebecca Clarke. Pre-concert talks start at 6:45; the concert itself begins at 7:30. I’ve got a copy of the script right next to me. If I was to give a bland description, I’d say it’s about the dual careers of Clara Schumann and Rebecca Clarke. If I was to give a slightly more provocative description, I’d say it’s about how the romantic hero great composer archetype (as personified by Beethoven) robs listeners of inspiring musical voices, including those of women. If any of that intrigues you, I’ll see you on Monday! Also, you should like HHCP’s new Facebook page for news, reminders, and tidbits about the works they’re spotlighting. More information about the concert and the season here! Women of Note at St. Paul’s Hill House! Lucky for me, all of those passions are combining in a single project this season. The Hill House Chamber Players are devoting their 2016/2017 season to spotlighting works by women, and they invited me to give a pre-concert talk before every show. The Hill House Chamber Players consist of some of the area’s most talented musicians, including some Minnesota Orchestra players. Together they perform in the James J. Hill House gallery, which used to be lined with art now at Mia. (I once heard a rumor that Jules Breton’s painting The Song of the Lark – which Willa Cather featured in her novel by the same name – hung in the Hill House gallery for a while, but I’ve never been able to prove or disprove that…) It’s a very cozy and intimate venue, and I’m really looking forward to chatting with audiences there. So pretty. The Hill House gallery. Image from the Minnesota Historical Society’s Flickr page. For more information on the season, and for pricing, click here! I want to thank the HHCP for having the guts to commit so wholeheartedly to their theme. When was the last time you heard of a chamber music series season that consists of two-thirds female composers? It’s a little early to know for sure, but it feels like works by women are gaining ground locally this year. Not only are the HHCPs committing wholeheartedly, but The Musical Offering is presenting works by Elsa Barraine and Lili Boulanger as part of their broader 2016/2017 theme of “Emigrés and Mentors.” If you have more examples of recent or upcoming local concerts featuring the work of women, please post in the comments! I’m optimistic that one of these decades, works by women might even show up in a meaningful way at a big-budget organization like the Minnesota Orchestra. But until they do, support your local chamber music scene. Inevitably, chamber music is where innovation starts. I look forward to seeing you guys at the Hill House! Can American Orchestras Do Better At Including Women Composers? Liane Curtis is a musicologist and the founder and President of both The Rebecca Clarke Society, and Women’s Philharmonic Advocacy, non-profit organizations which are based at the WSRC [Women’s Studies Research Center at Brandeis University]. A former Fulbright Scholar, Liane has taught at a wide range of colleges and universities, including Wellesley, Ohio State, and (in 2011 and 2007) at Brandeis University. She has written for the San Francisco Examiner, Bay Windows, The Musical Times, The New Grove Dictionary of Music, the National Women’s Studies Association Journal, Women’s Enews, The Gay and Lesbian Review, and other publications. In October 2006, Liane was a Fellow in the National Endowment for the Arts Journalism Institute in Classical Music and Opera. An impressive resume, but for me the thing that stands out about Liane is that she Cares Deeply About This Stuff. About a year ago, when I was beginning my study of the Clarke viola sonata, I sent her an email asking where the manuscript was. She sent me a link to a PDF of it right away. Never mind I was a largely self-taught violist based out of Eau Claire, Wisconsin, who had no plans to perform the piece publicly. (The manuscript, by the way, is fascinating – a must-read for any violist – and can be perused here.) She cares, and she was excited that I care, and that generous and free exchange of knowledge is hugely meaningful and exciting and awesome. Agree or disagree with any of her premises, she is a woman on a mission, and I appreciate that. Can American orchestras do better at including – rather than excluding – women composers??? And can the grants offered by Women’s Philharmonic Advocacy help? The recent inflammatory article in the Spectator (by Damian Thompson – no link here so you don’t encourage the clickbait), squashed so deftly by Emily E. Hogstad in this blog, and on New Music Box, reveals an overt instance of how deep-seated, hostile bias against women composers continues to survive. While overtly sexist statements such as those in the Spectator article are not as common as they were in the past, these same values are played out routinely in the current practice of dismissing and ignoring music by women. 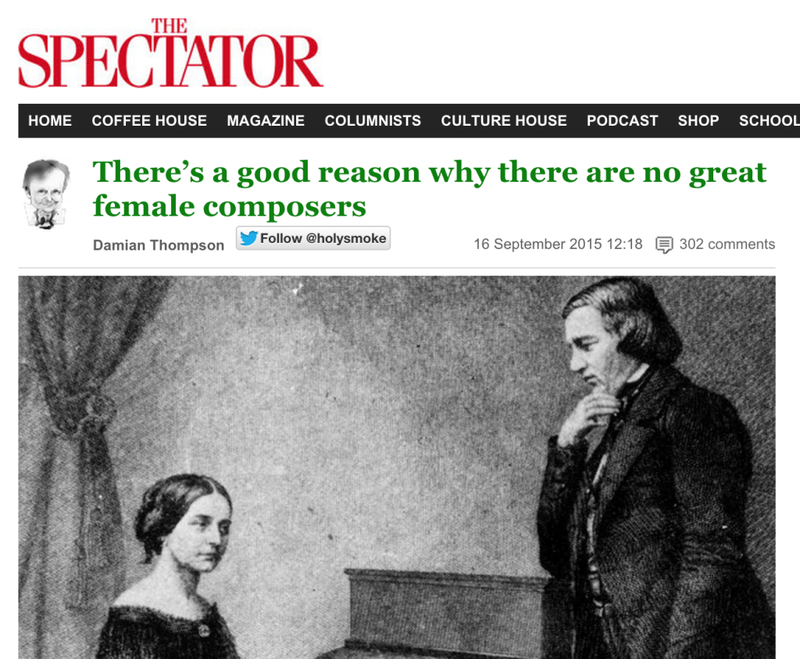 In short, when we see many orchestras routinely programming NOT ONE SINGLE work composed by a female in their entire season of classical orchestral programming, it is agreeing with Damian Thompson’s ignorant opinion that “there are no great women composers, [and] that’s because creative geniuses are rare and, in the past, so few women wrote music. There may be some in the future…” The orchestras that are in this group this season (2015-2016) include: the Cleveland Orchestra, National Symphony Orchestra, New York Philharmonic, Philadelphia Orchestra, Pittsburgh Symphony Orchestra, San Francisco Symphony, Seattle Symphony Orchestra, St. Louis Symphony and Utah Symphony. Just to point out one grievous case, the San Francisco Symphony is based in the city that was the home of The Women’s Philharmonic for all of its 20-plus years. Much of their past extensive fan base is there and would be eager to hear works by women. But one of our WPA supporters tells me that the SFS has excluded women composers in 17 of its past 20 seasons. The SFS prides itself for its creative, inventive programming, but to be so emphatic in ignoring women makes one wonder if there is some deep-set misogyny there. This is from The Current Opinion, January 1895. Since the days of Gobi, the Hindoo goddess, of Miriam, the Jewish maiden, and of the Sirens of ancient Greek mythology, a woman has figured conspicuously in the development of music. Although she has never been a great productive genius, although she has never created symphonies, operas and oratorios of lasting value, her influence has been such that, without it, we could hardly conceive our music off the present to be possible. In music we need all the faculties, all the characteristics, in a word, all the personality of the human being. Since the nature of woman is such as man does not possess; since the elements of male and female individualism combined make up what we know as human mind and soul, it is evident that, without the assistance of woman, without her influence, her emotions, her intuitions and her prejudices, a full development of music would be impossible. Since music is the language of the emotions and appeals directly to the heart, it must necessarily affect strongly a being so preeminently emotional, one who consults the heart much oftener than the head. As there exists a clearly defined masculine and feminine element in the nature and construction of music, it is evident that there must also be the same condition in its interpreters. The instrument justly considered to be most pre-eminently suited to women, because of its lightness, its form, the natural grace required in its treatment, but, above all, because of the deep poetry of its tones, its emotional qualities and its sympathetic appeals – the violin – was for years neglected by female musicians, for reasons which, plausible though they may seem, are, nevertheless, utterly without justification. Every twenty years ago it was an odd sight, and one that rarely failed to elicit visible and audible comment, not always charitable, when a girl or young woman carried a violin case through the streets of a city. Now it is quite different, thanks to a few noble women, who, not heeding this criticism as adverse as it was prejudiced, devoted themselves to the queen of all musical instruments. The violin, in the hands of a skilled female performer, appeals to the emotions of the listener as it does but rarely when played upon by a man, although the greatest depth and grandeur of which the instrument is capable have not yet been elicited by women. Prominent among women who have composed music is Clara Schumann, who has published many more or less acceptable pieces of vocal and instrumental music. Fanny Hensel, the sister of Felix Mendelssohn, composed a number of songs and pianoforte pieces in the style of her illustrious brother. Josephine Lang, a friend of the Mendelssohns, also composed some pleasing vocal music. Louis Ruget composed songs that were admired and sung, for the time being, throughout France and Belgium. Marie Malibran, the great vocalist, was also the author of several fine songs. A few years ago an opera composed by Ingeborg von Bronsart, the celebrated pianist, was performed at Weimar under the direction of the composer. This opera met with a favorable reception both from the public and from the musicians of that great art center. Among the few women who have gained fame as writers on musical subjects are Elisa Polka, Mrs. Raymond-Ritter and Anna March, who have written some excellent sketches and essays. But why is it that woman, who has gained the height of fame not alone as executive musician, but also as painter, poet and novelist, who has even manipulated the chisel and modeling-clay with success, and has attained renown at the bar and in the dissecting-room, has not excelled as a productive musician? Though woman is highly qualified by nature to express ideas in music as if they were the workings of her own soul, though she is peculiarly fitted to reflect the poetical nature of the art on the background of her own individuality, she cannot create these poetic reflections in compositions original with herself. Her nature is opposed to the cold reasoning and the solution of profound musical problems, such as must be encountered by the successful composer. This perhaps explains why there is not a single composition by a female musician that bids fair to hold even the second or the third rank. As a teacher of music, except in the field of theory, woman has been eminently successful, though it is painfully obvious that some, by their incompetence and superficiality, have done much to retard a healthful growth of musical understanding. In this capacity women have a great and glorious future before them.